Heartworm can strike your dog when you least expect it, and it can be devastating. Treatment for heartworm can be time consuming and expensive, so save yourself the headache and put your dog on Heartgard Chewables today to remove the possibility of infection. Once a month is all it takes to keep your dog safe from all risk of heartworm, and it comes in beef-flavored chewable that your pooch will love. Never has giving your dog medicine been so easy! 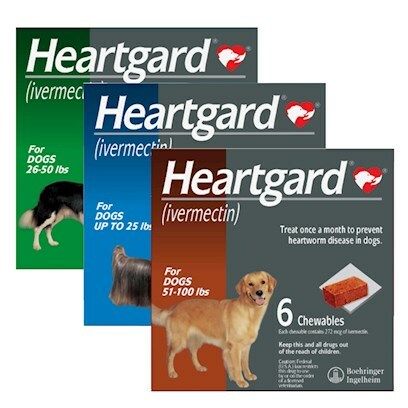 Start your dog on Heartgard for Dogs today. Side effects of taking heartworm preventatives are vomiting, diarrhea, general weakness, and seizures. Heartgard for Dogs should be kept out of reach of children. Heartgard Regular Chewables should be taken orally once a month to effectively prevent heartworms. Heartgard chewable tablets should be chewed, not swallowed whole.